Channing Tatum and wife Jenna Dewan-Tatum play a married couple in Jamie Linden’s “10 Years.” The flick, about a group of friends attending their high school reunion, is due out on September 14. In 2010, actress Jessica Alba took her daughter Honor Warren to "Yo Gabba Gabba! Live!" in Los Angeles, California. Even when she’s on set, Jessica Alba is focused on being a good mom – and not just for her own kids’ sakes. If you’re hoping to get Lady Gaga’s autograph, we suggest asking from afar. Otherwise you might end up face down on the floor, like the man her bodyguards restrained in the lobby of a Bucharest, Romania, hotel. 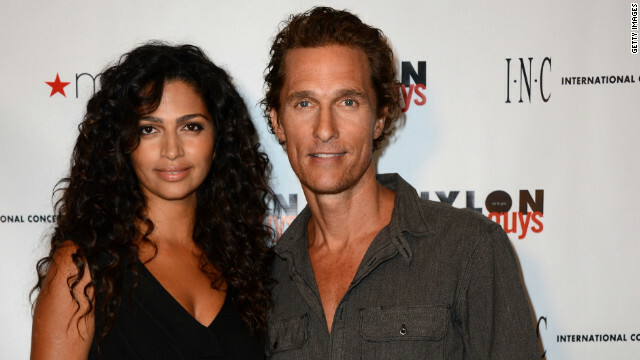 Despite his slimming down for a role, it sounds like Matthew McConaughey is spending quite a bit of time in the kitchen. He told Us Weekly that he’s “doing a lot of cooking” for wife Camila Alves while the pair anxiously await baby No. 3. On last night’s episode, Louie finally confronted his father. Or rather, his daddy issues. We’re not sure your box of crayons is going to do him justice, but you can try. Thanks to English artist Mel Simone Elliott, Ryan Gosling has joined the ranks of Kermit the Frog, Big Bird and other coloring book stars of yesteryear. “Colour Me Good Ryan Gosling” is “The cool colouring-book for good colourer-inners (as well as beginners).” It costs £7.50, about $12, and features images of Ryan and his dog George, scenes from some of his notable films and, of course, his abs. Now where are my colored pencils?